A delicious teriyaki marinade – made with soy sauce, brown sugar, ginger, and garlic – lends a sweet, briny flavor to chicken or tofu (or both). This one-dish-two-ways meal has been a favorite of ours for awhile now. The delicious teriyaki marinade – made with soy sauce, brown sugar, fresh ginger, and garlic – imparts its sweet, briny flavor whether you marinate chicken or tofu in it. I make up a batch and pour half of it over chicken and half over tofu. 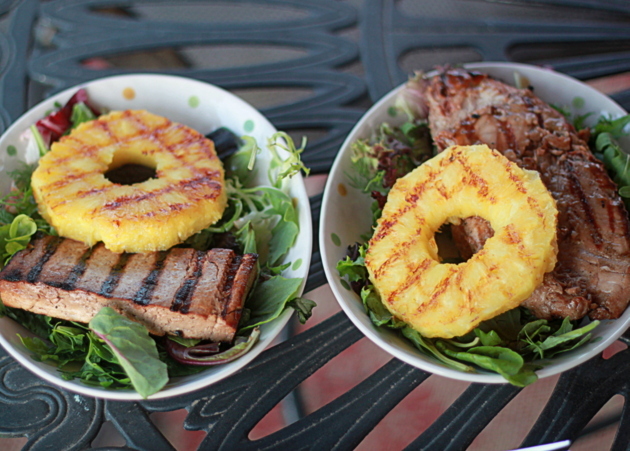 After a good soak in the marinade, my guy plops them on the barbecue (well-segregated, of course) along with fresh pineapple slices. And then we both enjoy an amazing dinner. I first posted this recipe on my old blog, but it’s such a good one I knew I had to rephotograph it and post it over here. 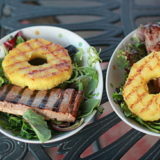 We made this while camping last weekend (sans pineapple, alas), and it turned out to be a surprisingly great and easy camping food. I just made the marinade before we left on Friday, then we threw it in with the chicken on Saturday morning. I marinated my tofu separately, of course. 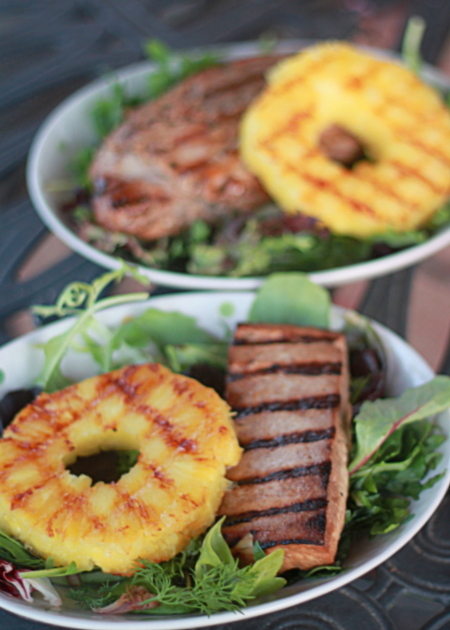 Then we grilled it up and with some yummy sides had an easy, delicious dinner Saturday night. In a small bowl, whisk together the vegetable oil, soy sauce, brown sugar, garlic, ginger, and sherry. Cut off any fat and place in a large Ziploc bag. With a rolling pin, pound chicken to 1/2 inch thickness. Pour in the marinade (or half the marinade if doing 1/2 chicken and 1/2 tofu) and place the bag of chicken in the fridge. Let the chicken marinate for 6 – 8 hours, turning once or twice if you can. Press the block of tofu to help get some of the moisture out. The best way to do this, I’ve found, is to line a plate with five or six paper towels, put the block of tofu on there, add another paper towel or two on top, and top with about four dinner plates. Let the dinner plates weigh down the tofu, pressing out the extra moisture, for 10-15 minutes. But watch your plates! Sometimes the tofu sinks down on one side and your plates are in danger of tumbling. Now lay the tofu slab on its back and slice into 5 – 6 slices about 3/4 inches wide (or 2 – 3 slices if using 1/2 chicken and 1/2 tofu). 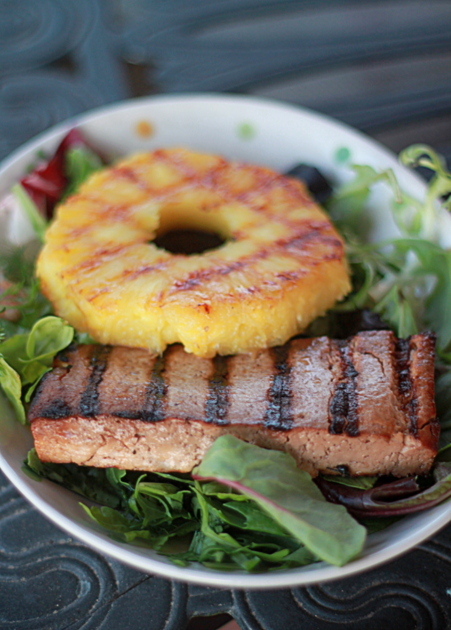 Lay tofu in a shallow bowl or pan and pour the marinade on the top. Unless you like your food salty (I admittedly do), I’d suggest marinating tofu for no more than a couple hours. Heat your grill to about 350-375 degrees, pull your chicken and/or tofu out of the fridge, and plop it on the grill. Turning often (be very careful with the tofu), grill for about 15 minutes or until the chicken is no longer pink inside and the tofu is just getting crisp around the edges and has dark grill lines. 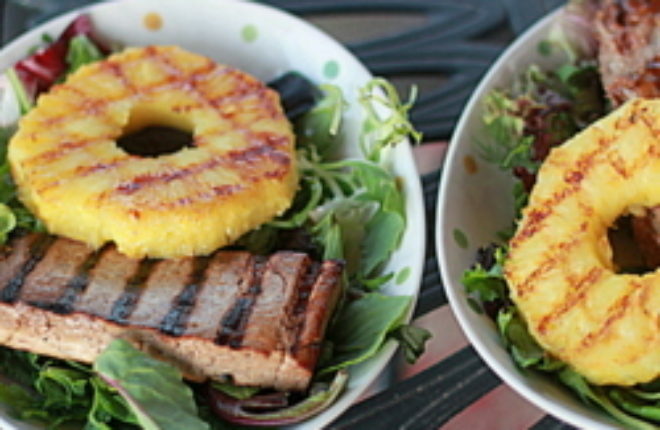 Grill the pineapple slices for about 2-3 minutes on each side and serve along side the chicken and/or tofu.